The UNAVCO Facility has completed construction of a testing facility located at Marshall, just outside Boulder, Colorado. The testing facility is funded by NASA-GGN through the UNAVCO cooperative agreement. NASA's Global GPS Network (GGN) faces many challenges in the near future primarily due to maintenance of aging equipment. In order to take advantage of the advancements in the Global Navigation Satellite System (GNSS), which include the launch of next generation GPS satellites, and the addition of Galileo, new equipment will need to be tested and validated. 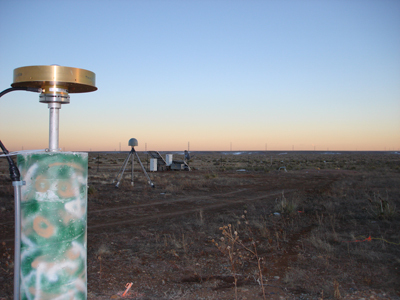 The Marshall facility will be used to test permanent GNSS station equipment in a controlled, but realistic environment, ensuring the GGN (accounting for approximately 15-18% of the International GNSS Service - IGS) will be prepared to meet the requirements of tomorrow's GNSS technology, and be able to model the uncertainties and biases that will inevitably follow the equipment upgrades at core reference frame sites. 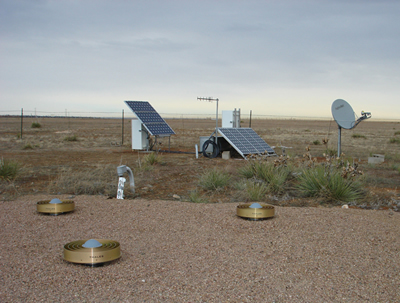 Some of the issues that will be addressed are: monument stability, position changes due to antenna replacements, methods for real-time data retrieval with minimal latencies using various communication methods and protocols, the effects of radome placement and removal on position solutions, along with rugged environmental testing of receiving and data collection equipment at various temperature extremes. The monuments constructed for this test facility purpose are located on opposite sides of P041, one of the first Plate Boundary Observatory (PBO) sites installed. P041 is a deep drilled braced monument and will serve as an excellent reference for processing the test data. Figure 1 - Testing Facility at Marshall with single pillar, MFP0, closest on the left.